The Sporting Arms and Ammunition Manufacturers’ Institute announced last week that it has accepted the new Winchester-designed straight-walled .350 Legend cartridge. The new round, which premiered at SHOT Show last month and caused buzz for its attributes that included a claim to the throne of the fastest production straight wall cartridge on the market, offers more energy than the classic .30-30 Win. with less recoil than the .243 Win. Aimed at the increasing number of “straight-wall-cartridge-compliant” deer-hunting states, the .350 looks to capitalize on the trend that has seen new rounds such as the .450 Bushmaster grow in popularity in the past few years. Winchester contends the Legend offers a flatter trajectory and better terminal performance over their competitors while remaining compliant in most states. 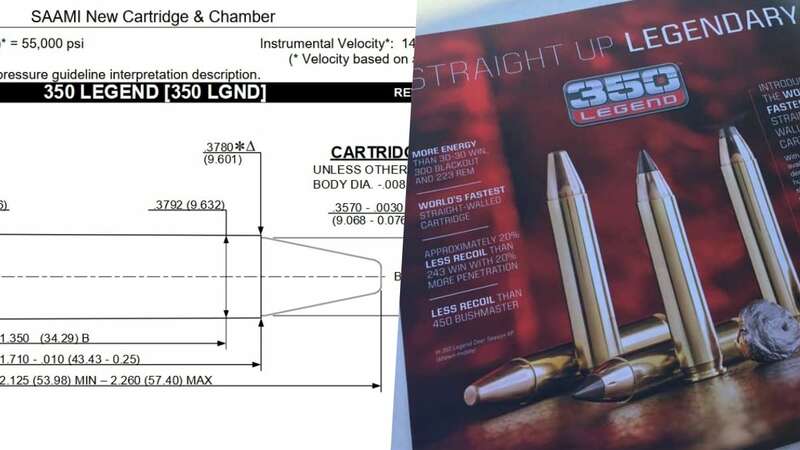 “The 350 Legend is a high-performing, straight-walled cartridge that dominates in velocity, energy, recoil and affordability, all of which are vital to our customers,” said Matt Campbell, VP of sales and marketing for Winchester Ammunition. Winchester is currently offering the Legend in a variety of loads including a 350-grain open tip Super Suppressed subsonic, a 150-grain Extreme Point, a 145-grain FMJ, and a 180-grain Power Point.